Irish Wolfhounds can live up to eight years of age. 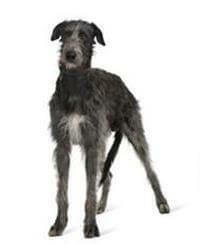 The Irish Wolfhound is often called the ‘gentle giant’ of the dog world. Its proud bearing, quiet dignity and intelligence are just some of its many wonderful characteristics. This is definitely a family dog with an incredibly affectionate nature, which thrives on human companionship. Regardless of whether you are looking for a Wolfhound with show potential or one as a companion and family pet it should be physically and temperamentally healthy, exhibiting the friendly even disposition that is essential to its character.